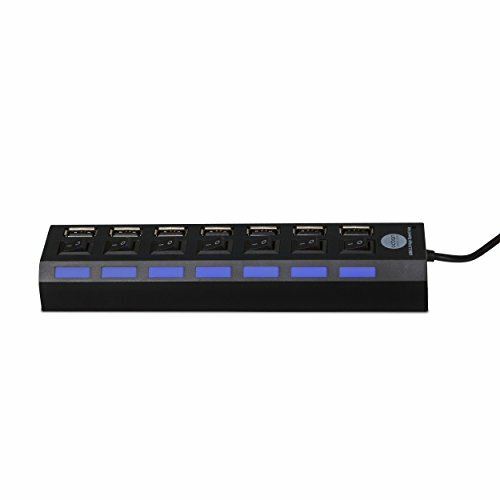 This MEGA USB hub allows for quick and convenient data transferring, charging, etc on devices that have limited usb ports. Simply plug the hub in, and you've effectively septupled (7x) the amount of available usb ports on your device! Thanks to individual switches, you can select which port you would like to use and which you rater have off. This helps with power consumption, keeps you organized, and allows you to quickly and effectively stop data transfer or charging of a device. • Gigantic Hub! Compact Size! This 7-port hub is truly a large expansion! 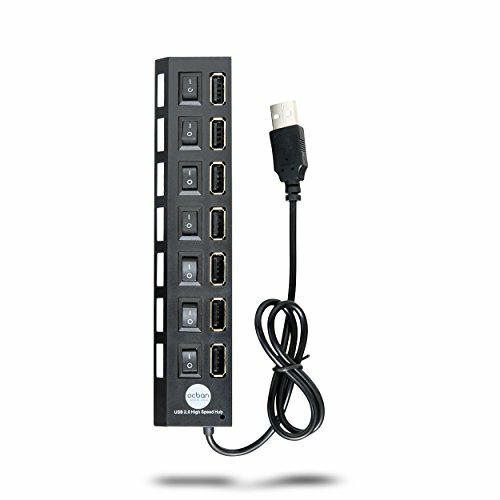 You can use 7 USB ports where you could previously only use 1! Even though it is a large expansion, the unit remains light, sturdy, and compact. Featuring 7 functional LEDS and switches, as well as a modern shaped hub design, this product is outstandingly good-looking and will keep an office or home computer looking modern and organized! Here at Ocban, we guarantee great products with excellent build quality at a fraction of the cost of our competitors. We have some of the best prices on amazon! Check out our other products or contact us for any questions or inquiries. 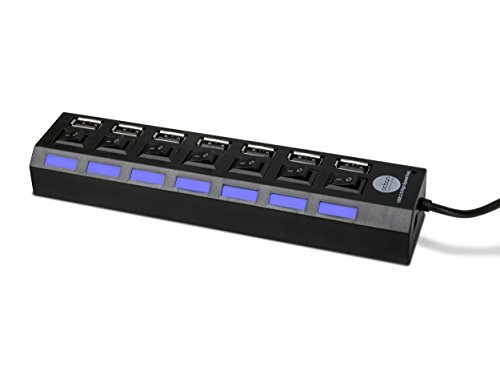 * LIGHT AND PORTABLE - Ocban's USB 7 Port Hub Expansion is built in a way that makes it light yet extremely study. This means you can toss it in your bag and take it on the go, allowing you to convert any single USB port into a 7 Port array. Where you could only charge 1 device at a time, you could now charge SEVEN! Perfect for traveling. 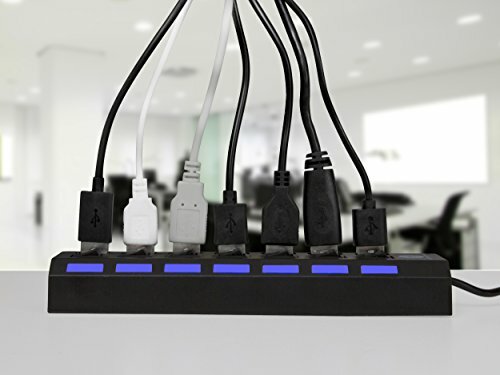 * BEAUTIFUL + FUNCTIONAL DESIGN - The LED's on our USB 7 Port HUB give it a modern and beautiful touch which is perfect for any office or desk setting. This design also allows for you to quickly and easily see which USB's are being powered and which are not. 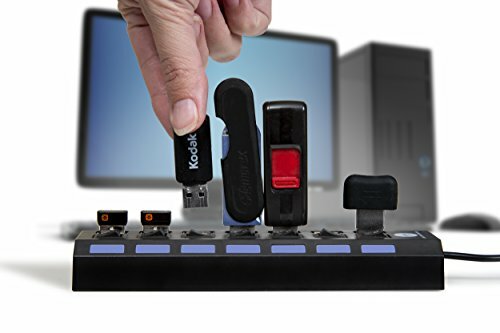 Convenience is Key when it comes to USB Peripherals and Expansion Hubs. 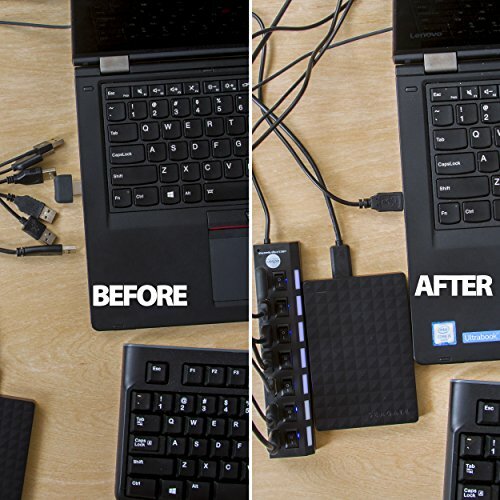 * EASY SWITCH SYSTEM - Each of the seven USB Ports on our USB HUB Splitter has a simple ON/OFF Switch next to it, allowing you to quickly and easily stop supplying power to devices which have finished charging and or transferring data. This means you don't have to unplug any cables and leave them out where they could get lost. * SATISFACTION GUARANTEED - We are sure this product will satisfy your needs and will function as advertised. If it does not, then contact us with your issues and we will work to help you solve them, or replace your product free of charge. If you have any questions about this product by Ocban, contact us by completing and submitting the form below. If you are looking for a specif part number, please include it with your message.